A comedy thriller, The Gun In Betty Lou's Handbag has ambitions as an all-out madcap farce, but is only partially successful. In a small Missouri town, Betty Lou Perkins (Penelope-Ann Miller) is a mousy and meek librarian, ignored by her co-workers and neglected by her police detective husband Alex (Eric Thal). When a mobster-turned-informant is shot dead in a local motel room, Alex is further immersed in his investigative work. While out walking the dog, Betty Lou stumbles upon the gun used for the murder, picks it up and is soon arrested. Instead of explaining the circumstances Betty Lou decides this is her moment to be at the centre of attention, and falsely hints that she is guilty of committing the murder, shocking Alex and the whole community. Dropped into a jail cell to await a trial hearing, Betty Lou meets prostitute Reba (Cathy Moriarty), who is full of assertiveness advice. Inexperienced lawyer Ann Orkin (Alfre Woodard) offers to represent Betty Lou, while violent mobster boss Beaudeen (William Forsyth) arrives in town, believing that Betty Lou now holds incriminating tapes. Directed by Allan Moyle, The Gun In Betty Lou's Handbag boasts a terrific cast brimming with talented actresses. 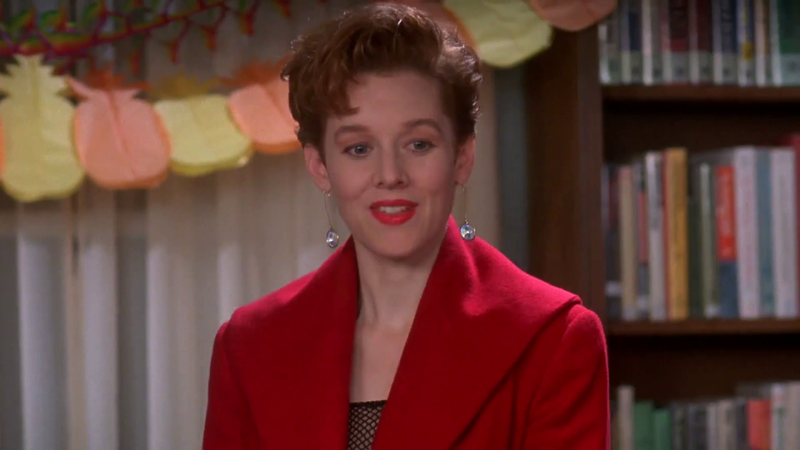 Penelope-Ann Miller, Alfre Woodard and Cathy Moriarty are joined by Julianne Moore and Catherine Keener in smallish early career roles. And the acting talent is a good fit for the primary theme of a woman finally deciding to stand up for herself. Of course Betty Lou chooses the wrong time and the worst possible incident to decide that enough is enough and disrupt the prevailing order of her life. Her actions create the ideal conditions for a high energy screwball comedy, but Moyle's directing and the Grace Cary Bickley script are only partially capable of delivering on the premise. The comedy elements are average, and the violence, courtesy of Beaddeen, veers towards unnecessary extremes of psychotic behaviour. The film is also hampered by lacklustre talent in the male acting department, Eric Thal an unfortunately bland presence and unable to generate neither chemistry nor authentic intensity. The sparse 89 minutes of running time suggest limitations somewhere in the concept development stage, and overall the film contains the whiff of a glorified made-for-television effort. But Penelope-Ann Miller is a spark in the middle of Betty Lou's wacky exploits, and her quest for meaningful recognition resonates beyond the film's narrow confines. With or without a gun in her handbag, Betty Lou will demand that her voice be heard.